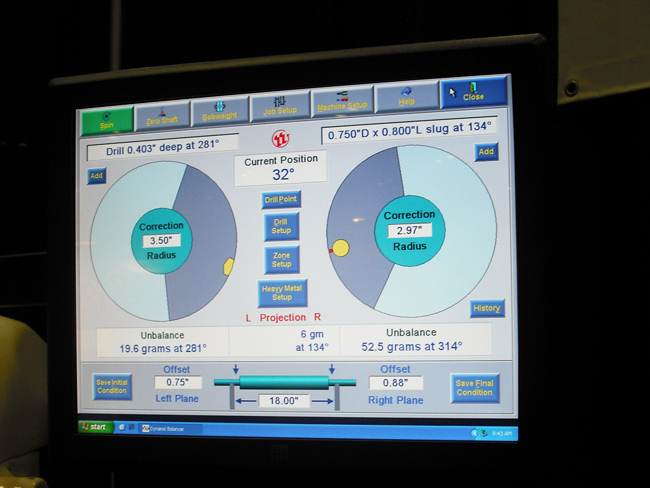 Computer Screen for crankshaft balancing operations. Balancing goes hand-in-hand with performance engine building. Balancing reduces internal loads and vibrations that stress metal and may eventually lead to component failure. From a technical point of view, every engine regardless of the application can benefit from balancing. A smoother-running engine is also a more powerful engine. Less energy is wasted by the crank as it thrashes about in its bearings, which translates into a more usable power at the flywheel. Reducing engine vibration also reduces stress on motor mounts and external accessories, and in big over-the-road trucks, the noise and vibration the driver has to endure mile after mile. Though all engines are balanced from the factory (some to a better degree than others), the original balance is lost when the pistons, connecting rods or crankshaft are replaced or interchanged with those from other engines. The factory balance job is based on the reciprocating weight of the OE pistons and rods. If any replacements or substitutions are made, there’s no guarantee the new or reconditioned parts will match the weights of the original parts closely enough to retain the original balance. Most aftermarket replacement parts are "balanced" to the average weight of the OEM parts, which may or may not be close enough to maintain a reasonable degree of balance inside the engine. Aftermarket crank kits are even worse and can vary considerably because of variations within engine families. If the cylinders are worn and a block needs to be bored to oversize, the larger replacement pistons may be heavier than the original ones. Some piston manufacturers take such differences into account when engineering replacement pistons and try to match "average" OE weights. But others do not. Most high performance pistons are designed to be lighter than the OE pistons to reduce reciprocating weight for faster acceleration and higher rpm. Consequently, when pistons and rods are replaced there’s no way of knowing if balance is still within acceptable limits unless you check it. When building a performance motor, a Stroker motor or an engine that’s expected to turn a lot of rpm's or run a lot of miles, balancing is an absolute must. No engine is going to survive long at high rpm's if it’s out of balance. And no engine is going to last in a high mileage application if the crank is bending and flexing because of static or dynamic imbalances. To better understand the mechanics of balancing, let’s look at the theory behind it. As everybody knows, a rotating object generates "centripetal force." Centripetal force is an actual force or load generated perpendicular to the direction of rotation. Tie a rope to a brick and twirl it around and you’ll feel the pull of centripetal force generated by the "unbalanced" weight of the brick. The faster you spin it, the harder it pulls. In fact, the magnitude of the force increases exponentially with speed. Double the speed and you quadruple the force. The centripetal force created by a crankshaft imbalance will depend upon the amount of imbalance and distance from the axis of rotation (which is expressed in units of grams, ounces or ounce-inches). 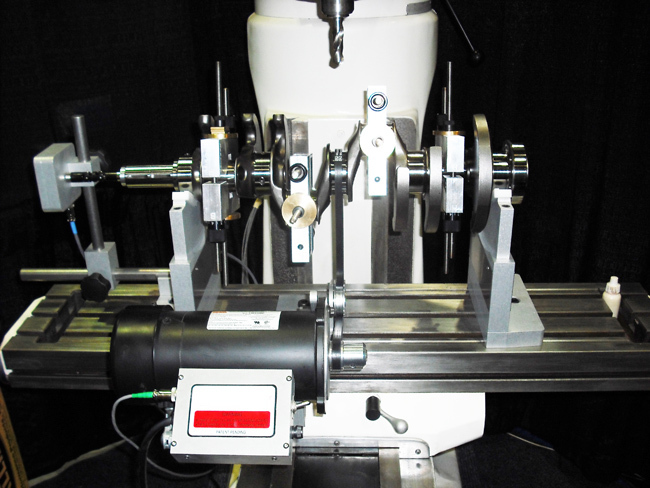 A crankshaft with only two ounce-inches of imbalance at 2,000 rpm will be subjected to a force of 14.2 lbs. At 4,000 rpm, the force grows to 56.8 lbs.! Double the speed again to 8,000 rpm and the force becomes 227.2 lbs. This may not sound like much when you consider the torque loads placed upon the crankshaft by the forces of combustion. But centripetal imbalance is not torque twisting the crank. It is a sideways deflection force that tries to bend the crank with every revolution. Depending on the magnitude of the force, the back and forth flexing can eventually pound out the main bearings or induce stress cracks that can cause the crank to snap. Centripetal force should not be confused with "centrifugal" force, which is the tendency of an object to continue in a straight trajectory when released while rotating. Let go of the rope while you’re twirling the brick and the brick will fly off in a straight line (we don’t recommend trying this because its difficult to control the trajectory of the brick). Back to centripetal force. As long as the amount of centripetal force is offset by an equal force in the opposite direction, an object will rotate with no vibration. Tie a brick on each end of a yardstick and you can twirl it like a baton because the weight of one brick balances the other. If we’re talking about a flywheel, the flywheel will spin without wobbling as long as the weight is evenly distributed about the circumference. A heavy spot at any one point, however, will create a vibration because there’s no offsetting weight to balance out the centripetal force. This brings us to another law of physics. Every object wants to rotate about its own center of gravity. Toss a chunk of irregular shaped metal into the air while giving it a spin and it will automatically rotate about its exact center of gravity. If the chunk of metal happens to be a flywheel, the center of gravity should be the the flywheel’s axis. As long as the center of gravity for the flywheel and the center of rotation on the crankshaft coincide, the flywheel will spin without vibrating. But if there’s a heavy spot on the flywheel, or if the flywheel isn’t mounted dead center on the crank, the center of gravity and axis of rotation will be misaligned and the resulting imbalance will create a vibration. Okay, so how does all this scientific mumbo jumbo translate into the real world dynamics of a spinning crankshaft? A crankshaft, like a flywheel, is a heavy rotating object. What’s more, it also has a bunch of piston and rod assemblies reciprocating back and forth along its axis that greatly complicate the problem of keeping everything in balance. With inline four and six cylinder engines, and flat horizontally opposed fours and sixes (like Porsche and Subaru), all pistons move back and forth in the same plane and are typically phased 180° apart so crankshaft counterweights are not needed to balance the reciprocating components. Balance can be achieved by carefully weighing all the pistons, rods, wrist pins, rings and bearings, then equalizing them to the lightest weight. On V6, V8, V10 and V12 engines, it’s a different story because the pistons are moving in different planes. This requires crankshaft counterweights to offset the reciprocating weight of the pistons, rings, wrist pins and upper half of the connecting rods. With "internally balanced" engines, the counterweights themselves handle the job of offsetting the reciprocating mass of the pistons and rods. "Externally balanced" engines, on the other hand, have additional counterweights on the flywheel and/or harmonic damper to assist the crankshaft in maintaining balance. Some engines have to be externally balanced because there isn’t enough clearance inside the crankcase to handle counterweights of sufficient size to balance the engine. This is true of engines with longer strokes and/or large displacements. If you’re rebuilding an engine that is internally balanced, the flywheel and damper have no effect on engine balance and can be balanced separately. But with externally balanced engines, the flywheel and damper must be mounted on the crank prior to balancing. Customers should be told what type of engine balance they have (internal or external), and warned about indexing the position of the flywheel if they have to remove it later for resurfacing. Owners of externally balanced engines should also be warned about installing different flywheels or harmonic dampers and how it can upset balance. In recent years, the auto makers have added balance shafts to many four and six cylinder engines to help cancel out crankshaft harmonics. The counter-rotating balance shaft helps offset vibrations in the crank created by the firing sequence of the engine. On these motors, make sure the balance shaft is correctly "phased" or timed to the rotation of the crank. If the shaft is out of sync, it will amplify rather than diminish engine vibrations. Balance shafts are not a substitute for normal engine balancing, nor do they reduce the vibration and stress the crankshaft itself experiences as it turns. The process of balancing begins by equalizing the reciprocating mass in each of the engine’s cylinders. 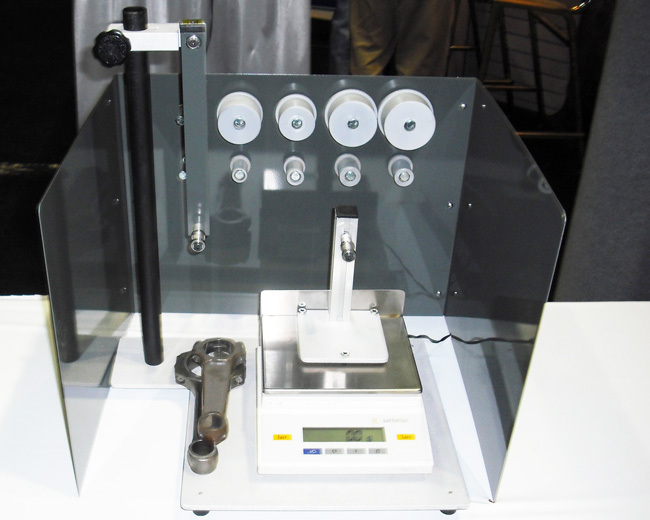 This is done by weighing each piston on a sensitive digital scale to determine the lightest one in a set. The other pistons are then lightened to match that weight by milling or grinding metal off a non-stressed area such as the wrist pin boss. The degree of precision to which the pistons are balanced will vary from one engine builder to another, and depends to some extent on the application. But generally speaking pistons are balanced to within plus or minus 0.5 grams of one another. Next the rods are weighed, but only one end at a time. A special support is used so that the big ends of all the rods can be weighed and compared, then the little ends. As with the pistons, weights are equalized by grinding away metal to within 0.5 grams. It’s important to note that the direction of grinding is important. Rods should always be ground in a direction perpendicular to the crankshaft and wrist pin, never parallel. If the grinding scratches are parallel to the crank, they may concentrate stress causing hairline cracks to form. On V6 and V8 engines, the 60 or 90 degree angle between the cylinder banks requires the use of "bob weights" on the rod journals to simulate the reciprocating mass of the piston and rod assemblies. Inline four and six cylinder crankshafts do not require bob weights. To determine the correct weight for the bodyweight, the full weight of a pair of rod bearings and the big end of the connecting rod, plus half the weight of the little end of the rod, piston, rings, wrist pin (and locks if full floating) plus a little oil are added together (100 percent of the rotating weight plus 50 percent of the reciprocating weight). The correct bodyweight are then assembled and mounted on the crankshaft rod journals. The crankshaft is then placed on the balancer and spun to determine the points where metal needs to be added or removed. The balancer indexes the crank and shows the exact position and weight to be added or subtracted. The electronic brain inside the balancer head does the calculations and displays the results. The latest machines have graphical displays that make it easy to see exactly where the corrections are needed. If the crank is too light, which is usually the case on engines with Stroker cranks or those that are being converted from externally balanced to internally balanced, heavy metal (a tungsten alloy that is 1.5 times as heavy as lead) is added to the counterweights. This is usually done by drilling the counterweights, then press fitting and welding the heavy metal plugs in place. An alternate technique is to tap the hole and thread a plug into place. Drilling the holes sideways through the counterweights parallel to the crank rather than perpendicular to the crank is a technique many prefer because it prevents the metal from being flung out at high rpm. 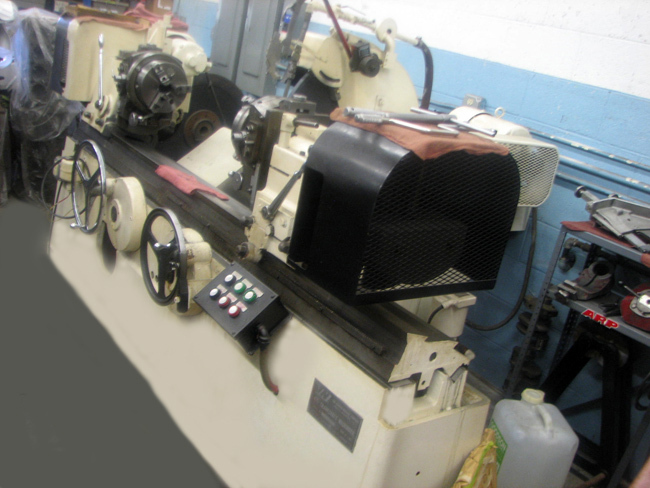 After drilling, the crankshaft is again spun on the balancer to determine if additional corrections are required. If the crank is for an externally balanced engine (such as a big block Chevy), the balancing will be done with the flywheel and damper installed. On internally balanced engines, the flywheel and damper can be balanced separately, or installed on the crank and balanced as an assembly once the crank itself has been balanced.